A literary mystery appeared to be solved this year when a long-lost manuscript of Pearl S. Buck's novel "The Good Earth" surfaced in a sale tied to a former secretary's family. The auction house involved called the FBI, and U.S. officials proudly gave the typed manuscript to Buck's heirs, her seven adopted children. But at least two foundations with links to the Pulitzer and Nobel Prize winner, who died in 1973, now hope to share in the discovery.And a legal brawl could be on tap after one of them -- a board of mostly elderly women that runs Buck's birthplace in West Virginia -- stepped forward in recent days to lay claim to the valuable papers. The board maintains that Buck left all of her manuscripts to the birthplace in a 1970 legal document. "She said her intent was to provide these as a source of funds if ever needed to maintain her mother's home," said lawyer Steve Hunter of Lewisburg, W.Va., who represents the Pearl S. Buck Birthplace in tiny Hillsboro. Pearl Comfort Sydenstricker was born on the West Virginia property on June 26, 1892. The legal affidavit was signed and notarized on Oct. 15, 1970, and filed at the Pocahontas County Courthouse on March 21, 1973, two weeks after Buck died. 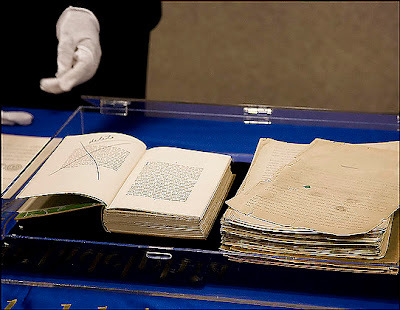 In the document, Buck estimates the value of her collection of manuscripts at $650,000 to $1 million, although she calls them "priceless to me. "She lists scores of documents she was giving to the birthplace, including " 'The Good Earth' manuscript, the exact location of which is unknown."